CISER, the Cornell Institute for Social and Economic Research, offers free workshops in statistical research methods each semester. Some of the available workshops include how to use statistical software like Stata and SPSS (separate classes) and accessing restricted social science data at Cornell. View the schedule and sign-up here. Access is by IP address, so you can access MPEPIL from any computer in the Law School or from http://uportal.cornell.edu. Another recommended Oxford encyclopedia relating to international law is the Encyclopedia of Human Rights, also available online. 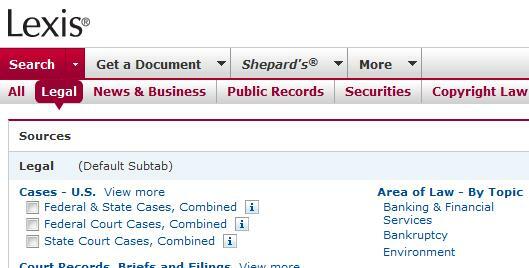 If you have signed on to Lexis recently, you’ve likely noticed a new look. Like Westlaw, Lexis is currently in a period of change. Later this year, Lexis will roll out a new platform to compete with WestlawNext. But recently, Lexis has adjusted the interface of their current platform to make it more user-friendly and eye-appealing. The interface uses crisper lines, fewer colors, and even more white space than the previous interface. A change that many will appreciate is the reduction in the number of tabs running along the top of the page. The most important tabs—Search, Get a Document, and Shepard’s—still appear; however, the many other available features are now tucked under a tab labeled “More.” This is a great improvement. Both the Recently Used Sources and Search by Topic or Headnote features have been moved to the right side in their own boxes. This change achieves the dual goal of reducing clutter while making these features more prominent. Also on the right side one sees Quick Tools, which allows users to quickly pull up documents, Shepardize, locate a source, or use the Lexis web with a single search box. The right side also includes an Emerging Issues section highlighting articles posted by practitioners in an array of practice areas. Overall, the changes Lexis has made are for the better. In time, we will see what their answer is to WestlawNext. The Legal History and Rare Books Section (LH&RB) of the American Association of Law Libraries, in cooperation with Cengage Learning, announces the third annual Morris L. Cohen Student Essay Competition. Students currently enrolled in accredited graduate programs in law, library science, history, or related fields are eligible to enter the competition. Essays may be on any topic related to legal history, rare law books, or legal archives. The entry form and instructions are available at the LH&RB website: http://www.aallnet.org/sis/lhrb/. Entries must be submitted by March 15, 2011. The winner will be announced by April 15. The winner will receive a $500.00 prize from Cengage Learning and up to $1,000 for expenses associated with attendance at the AALL Annual Meeting in Philadelphia in July 2011. The runner-up will have the opportunity to publish the second-place essay in LH&RB’s online scholarly journal Unbound: An Annual Review of Legal History and Rare Books. Please direct questions to Robert Mead at libram@nmcourts.gov or Sarah Yates at yates006@tc.umn.edu. Time magazine archive: Martin Luther King, Jr. 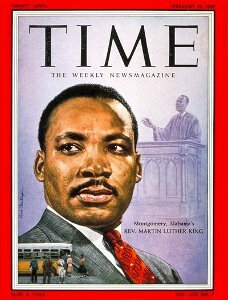 In honor of Martin Luther King, Jr. Day yesterday, I’m posting the link to Time magazine’s archive of articles and covers about the civil rights leader. The early articles’ text captures the anger of those tumultuous times, both of blacks and of whites. Then compare those articles with the Time 100 retrospective of King, published in 1998. More than a dreamer: Remembering Dr. Martin Luther King, Jr. Monroe H. Little, Jr. 41 Indiana Law Review 523 (2008). Civil rights, immigrants’ rights, human rights: Lessons from the life and works of Dr. Martin Luther King, Jr. Jennifer M. Chacón. 32 New York University Review of Law and Social Change 465 (2008). Dr. King and Parents Involved: The battle for hearts and minds. Wendy B. Scott. 32 New York University Review of Law and Social Change 543 (2008). The radical King: Perspectives of one born in the shadow of a king. Camille A. Nelson. 32 New York University Review of Law and Social Change 485 (2008). Surveillance and identity performance: Some thoughts inspired by Martin Luther King. Frank Rudy Cooper. 32 New York University Review of Law and Social Change 517 (2008). Jim Bishop, 2L, has won an iPad from BNA! He registered to receive BNA updates, along with thousands of other law students across the country. And Jim was the winner! If you want to receive BNA updates from US Law Week or on topics from banking to tax, labor law to mergers and acquisitions – go to http://library2.lawschool.cornell.edu/bna/subj/ and sign up for your choice of e-mail summaries.